Leinier Dominguez is not rusty after more than two years away from classical chess. | Photo: Austin Fuller/Saint Louis Chess Club. 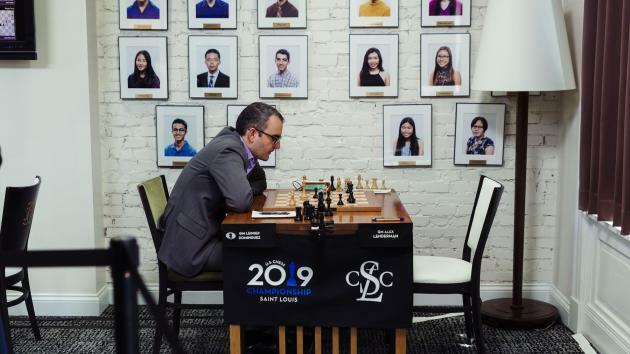 Yasser Seirawan dubbed first-time U.S. championship player Leinier Dominguez the "quiet assassin" today as he wrapped up his second consecutive victory to join Hikaru Nakamura atop the tables. Both men are on 5.5/8 after the recent American transfer won an equal-looking ending today in round eight and also grinding one out yesterday. Although many Cuban-American players have come before him at the U.S. championship, Dominguez is attempting to become the first to win the tournament in this, his first attempt. In fact he hasn't played any rated classical chess at all since the fall of 2016 due to his FIDE transfer precluding him from competing. "I don't feel like [having] not played for two years," Dominguez said. He revealed to Chess.com that it's not easy playing any warm-up games with high-level competition in classical time controls, but he did squeeze in a single game before coming to St. Louis. In the women's event, the assassin is not so hidden. WGM Jennifer Yu keeps finding a way to deliver. Like Dominguez, she's also 2-0 since our last report, and has raised her score to an astounding 7.5/8. WGM Jennifer Yu, very likely the next American woman to become an IM. | Photo: Austin Fuller/Saint Louis Chess Club. Yesterday's round seven was particularly violent, with 10 combined wins from the 12 games played in the twin tournaments. On the ladies' side, the "A-listers" got the job done as four of their five wins came from women named Ashrita, Akshita, and the two Annas. Only Jennifer broke that stat, much like she's been breaking the field. Her game was quite up and down. Seemingly crushing out the opening with a white pawn on the seventh early and even some hopes of a mate on board in the first 15 moves, the high school junior then let past champion WGM Sabina Foisor back into the game. Yu seemed as surprised as anyone that she let Sabina Foisor's king off the hook. | Photo: Crystal Fuller/Saint Louis Chess Club. Yu bailed out into an exchange-down ending, then Foisor overestimated her chances and passed up a perpetual. Yu told Chess.com she thinks that her opponent was still living in the mentality from a few moves prior when she was better. Still, the youngster didn't pull away at all from her main chaser. IM Anna Zatonskih kept pace by beating annual rival GM Irina Krush, who faded all the way down to near the bottom of the standings with yet another loss. They usually face each other once per year, but thanks to the Cairns Cup, this is their second meeting in two months (they've now split the 2019 series, 1-1). | Photo: Austin Fuller/Saint Louis Chess Club. You'd have to go back a long time to see if Krush, a seven-time winner, ever finished on a minus score at this event. Or you could just ask the unofficial U.S. championship statistician Ed Gonsalves, who knew right away. In 1995, Krush mustered only five draws to go with four losses. Of course, she was only 11. In round seven of the U.S. championship, the four winners all came from the tournament's top scorers. That list included Fabiano Caruana, who was the beneficiary of more unpredictable behavior from Timur Gareev, although this was at least of the chess variety. Gareev attempted to play in another tournament concurrently, showed up late to a U.S. championship round, and has repeatedly arrived with questionable clothing choices. Gareev then failed to master the exact ending that he just performed flawlessly three rounds previously. He's adjusted his outfit to fall in line with tournament policies, and apparently Timur Gareev's facial hair is also OK for this tournament (or even to play for the Reds). | Photo: Austin Fuller/Saint Louis Chess Club. In round four, Gareev held rook+bishop-vs.-rook flawlessly, but in round seven, he couldn't do the same against the world championship challenger. Caruana's persistence paid off in the one of the longest U.S. championship wins in history. Caruana's had the ending a bunch before, usually on the "better" side. Here's one example of his. He also had it in a critical game at the 2018 Chess Olympiad, where a study-like win was missed. Want to practice it yourself? Try this drill! Nakamura also won to keep some distance with Caruana at the top, but just like in the women's event, another teenager continued to make waves on the other side of the room. Sam Sevian's blistering attack on Ray Robson didn't give the usually-resourceful St. Louis resident any chance to make any complications. It didn't help that Robson went poisoned pawn grabbing—too bad he didn't watch the most recent ChessKid video! The win kept Sevian, Caruana and Dominguez all a half-point behind Nakamura after the very top-heavy round. In today's round eight, Nakamura took White but couldn't quite get a large edge against defending champion Sam Shankland. But that didn't surprise him. "That's the most you can ask for these days, making your opponent feel uncomfortable," Nakamura said. "That's chess in 2019...Ask Magnus [Carlsen], ask anyone, that's pretty much that they'll tell you." That grinder's mentality was on full display for Dominguez, who squeezed out a win in what seemed to be a mostly-equal rook ending, even for him. Sevian played the first 20 moves in less than 20 minutes, then paused, spending 25 minutes trying to figure out how to play with his blockaded passer. Dominguez and his kiss of death. | Photo: Lennart Ootes/Saint Louis Chess Club. Some hints of an attack went by the wayside, and the new leader then saw the ending after the queens traded couldn't be worse for him, but he still didn't hold out hope for catching Nakamura. "After he took on e6 I thought it was going to be a dead draw," Dominguez said. This was the longest game of the round and the only win. Caruana wasn't able to keep pace as he drew Wesley So after both entered an opening with limited knowledge. Caruana said he "a bit optimistic" after his pawn sacrifice and placement of bishop on f4 caused So to think right out of the gate. He said was on his own as early as move 11 (...Nde7). "I couldn't remember anything about this position," he told Chess.com. With Hikaru Nakamura on a full beard and Gareev too, Fabiano Caruana is trying to keep pace the best he can. | Photo: Lennart Ootes/Saint Louis Chess Club. It's not that he secretly stashed the 9. Bf4 line in his quiver; instead it was something Caruana only went for after So surprised him with 5...c5. Of course, in this reductio ad absurdum, Caruana said he was trying to surprise his opponent with the Catalan. Perhaps it's only Gareev's fashion sense that is truly a way to surprise your opponent even before move one! As for the game, Caruana said he wasn't that pleased and felt he wasn't better at all after recovering the pawn. With limited access to Caruana during the world championship, Chess.com now got a chance to ask him about the experience of playing for the title. Memories of the grueling event still seemed fresh on his mind. "After the world championship, I needed a break," he said. "I was pretty wiped out emotionally and physically. "It's not pleasant but I think it's worth it. I can't say there's any joy, except for the satisfaction if you win," he said. In the women's event today, the field cooled down a bit, but still produced wins in half of the games. Yu could have again faced some adversity, but WIM Akshita Gorti didn't challenge Black's queen on the open file when the time was right. "When I played 18...Nb8 I thought something just didn't seem right," Yu said. Yu's incredible 7.5/8 comes on the heels of a disappointing warm-up event, where she played her peers. At the 2019 National High School Championships, she dropped four draws in her seven rounds (three against non-masters) to finish 24th. Still, she thinks these seven games in three days benefitted her. "I actually came in warmed up," she said. Although the women's event has been about half teenagers for several years, they've yet to win one (although Annie Wang, far right, nearly did last year). This year Yu (far left) is seeking to lead the pack to victory. Photo: | Lennart Ootes/Saint Louis Chess Club. Krush got back on track a bit with a win, only her second of the event. She will still need 2.5/3 to avoid a minus score for the first time in 24 years (more than half of the field wasn't even alive then). Amazingly, with the veteran Zatonskih and the fresh-faced Yu turning in such top-heavy results, someone can actually have a minus score but still be in the top half of the tables in the women's event. In case you are wondering, yes, the $64,000 "Fischer Prize" was in effect for this tournament, which is about the only thing unattainable for Yu this fortnight. In the U.S. championship, the field is much more compact. Five players are leading or within a point of the lead, while defending champion Shankland is all but eliminated from defending his title. Although he didn't know it at the time, Hikaru Nakamura checked out the game of his now co-leader Dominguez yesterday. | Photo: Lennart Ootes/Saint Louis Chess Club. The official broadcast of round eight.